I've been a huge George Scott fan and I've been building a nice personal collection of his appearances. 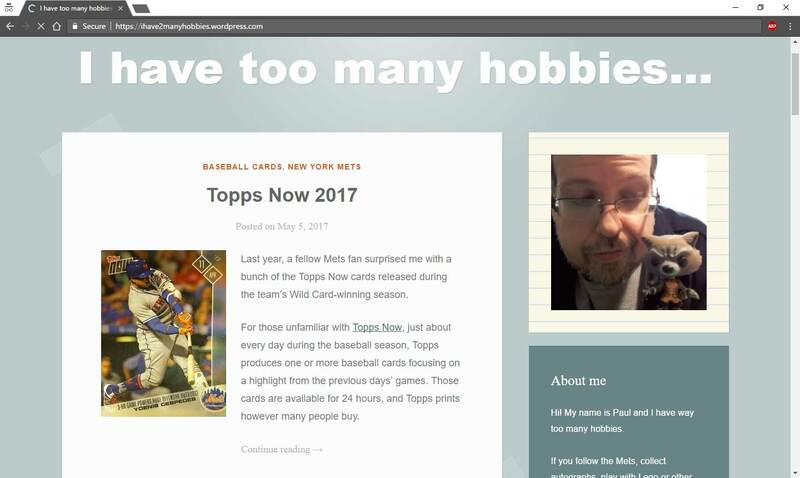 I finally tracked down his 1966 Topps rookie card last summer and back in 2010 I featured his second-year card from 1967 Topps in my Heartbreaking Damage series as someone had corrected Scott's weight on his card, adding 25 pounds. 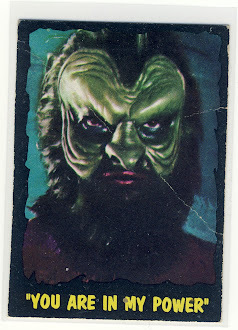 Some of his 1970's cards are known for their airbrushing, including his 1977 O-Pee-Chee card which features an airbrushed Red Sox batting helmet. 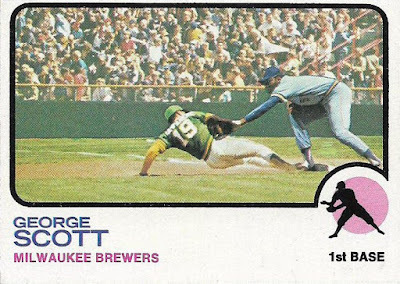 His 1973 Topps card also has that look that something isn't quite right with the photo. The player images seem to be superimposed over the crowd photo and I thought it was so interesting I used the card as a part of a contest giveaway back in 2011. 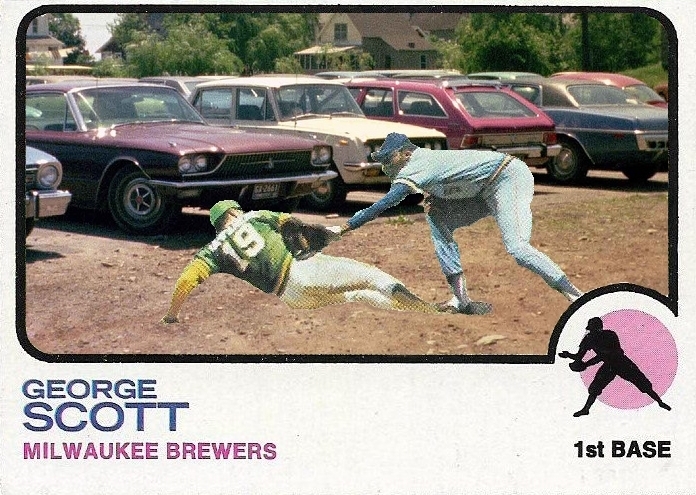 Night Owl Cards brought up the '73 Topps card in honor of Scott's birthday on March 23rd and Bobbie of Detroit Tigers Cards and Stuff commented the the original background probably included a row of cars, just like this gem from 1973 Topps. 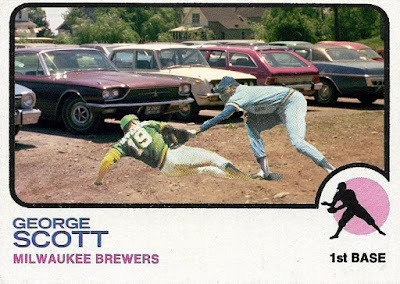 This inspired me to show the original George Scott card without the airbrushing..and sure enough, the action was taking place in front of a row a cars in a dirt parking lot! 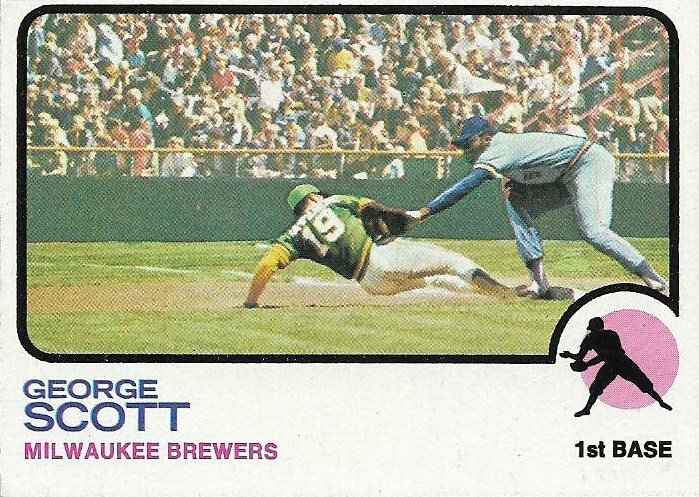 Scott's original 1973 Topps #263.